I am in a “get the look” phase right now and as a result you’ll be able to see back to back celebrity inspired looks. 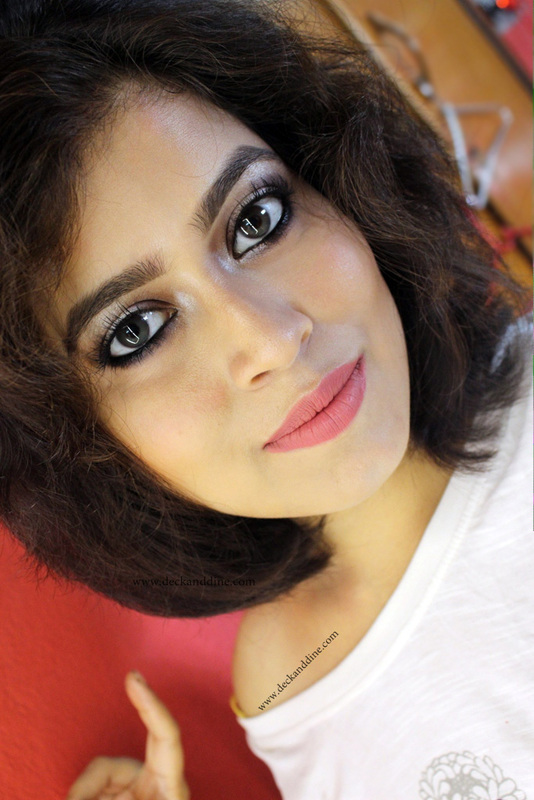 I guess you all have already seen my version of Aishwarya Rai’s Blue Smoky eyes at the Cannes 2016 (if not, click HERE) and today I am back with another celebrity inspired makeup from the Cannes Red Carpet 2016. Today my source of inspiration is Sonam Kapoor. She donned a simple and sassy look for her second day at the Cannes Film Festival. But what i liked mostly about the whole look was her makeup. It was a morning affair and I fell in love with the look instantly. The Ralph and Russo couture no doubt felt so youthful, but her makeup hogged all the limelight. Chic, sassy and so summery. So here I am presenting my version of Sonam Kapoor’s look at the Press Conference in Cannes 2016. 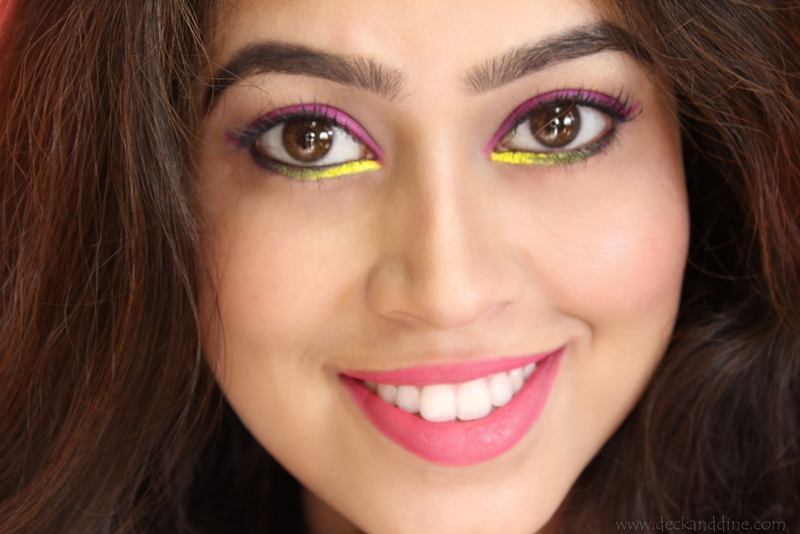 This is a very fresh, easy to do makeup look and is perfectly appropriate for summers. So lets the tutorial begin..
BASE:-Start by prepping your skin. Apply a moisturizer and also don’t forget your sunscreen if you are going out in the sun. Apply dots of your favorite liquid foundation all over the face and blend with a wet sponge. This will give a dewy finish. Apply a concealer under your eyes and on any discoloration on the face.Groom your brows and buff little brown eye shadow on the crease to define it. I framed my eyes with a thin stroke of black Kohl and smudged it. You can ignore this step, but I prefer doing this as it makes the colored liners pop. Now as you can see Sonam Kapoor is wearing a pink eye liner on her upper lash line. Well I don’t have a pink liner so I went with my pink lip liner. I draw a line as close to my kohled line, starting near the tear duct and ended with a wing at the end of each eye. 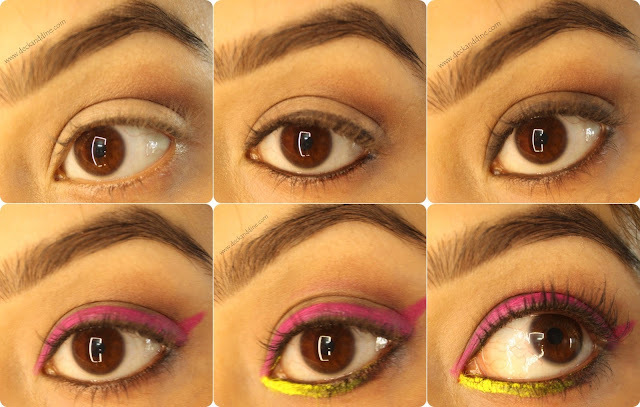 Add a touch of yellow to the inner corner of the eyes. Finally apply loads of mascara to finish your eye makeup. 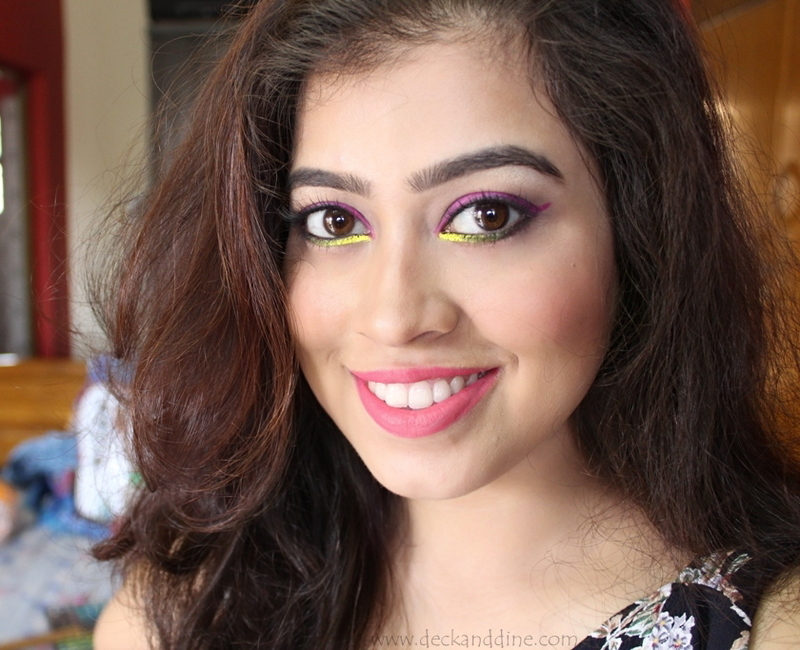 Apply a pink blush on the cheeks and your favourite highlighter on the high cheek bones and nose bridge. 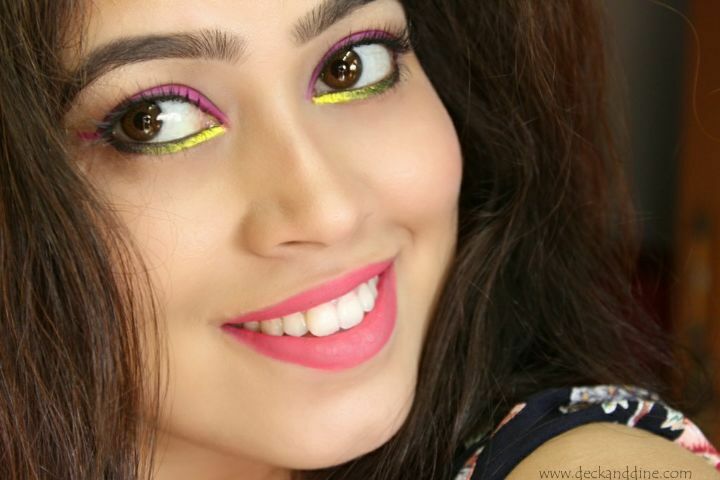 Apply a pink lip cream to round of your look. So hope you liked the look. Also let me know your favorite Cannes celebrity looks this year. I’ll try recreating them. Can u tell me the lip color?? I think the yellow part popped up a notch high for this whole look. You are looking better than Sonam. Love the lip colour. What's the shade name?? ?